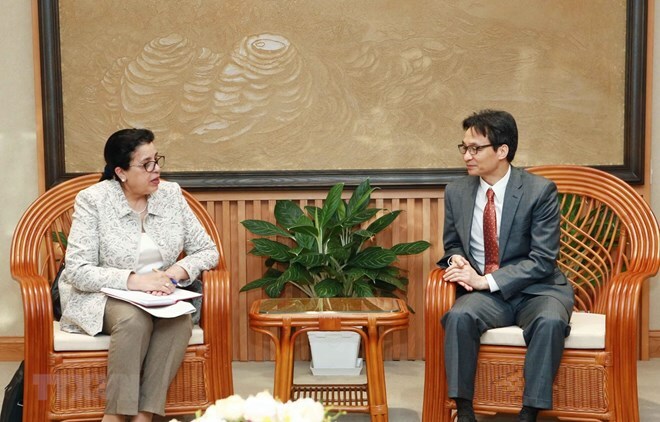 Hanoi (VNA) – Deputy Prime Minister Vu Duc Dam spoke highly of the International Atomic Energy Agency (IAEA)’s role in promoting the application of atomic energy for peaceful purposes during a reception in Hanoi on April 5 for its Deputy General Director Najat Mokhtar. Dam said ties between Vietnam and the IAEA have been growing in recent years via technical cooperation projects, including developing nuclear infrastructure in healthcare, agriculture, industry, environmental protection, food security, and climate change response. According to him, the IAEA contributed to raising the capacity of building Vietnam’s legal documents in the fields of nuclear energy, radiation, and nuclear safety management. During 2014-2019, Vietnam launched 20 national and 48 regional or inter-regional projects funded by the IAEA. For the 2020-2021 period, Vietnam’s five new projects have received approval from the IAEA. In late 2018, the Vietnam Atomic Energy Institute and the IAEA signed an agreement on establishing a cooperation centre using nuclear technology for the management of water resources and environment in Vietnam and coastal areas in Southeast Asia. Mokhtar herself also assisted Vietnam’s medical establishments in using nuclear technology in cancer diagnosis and treatment. The host wished that the IAEA and Mokhtar would continue supporting Vietnam in registering new technical cooperation projects, personnel training, and building a nuclear science and technology research centre. The IAEA Deputy General Director, for her part, said Vietnam is the first country she chose to visit after assuming the position. Lauding Vietnam’s achievements in adopting nuclear technology for peaceful purposes, she said she hopes to learn about the country’s nuclear technology application in socio-economic sectors during her visit.